Do you have that fear of the yips? Or maybe you have committed several throwing errors but can’t figure out why? The yips may very well be the cause. The yips happen when you take a normally unconscious action (throwing the ball) and move it into the conscious realm (thinking and analyzing throwing the ball during the act). 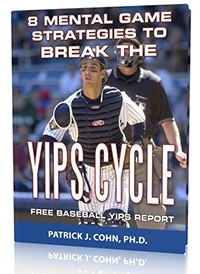 The yips can cause any baseball player to question their ability to play the game they once loved. In fact, you kind of expected the error to happen. The “throwing yips” can make the best baseball player feel incompetent. The doubt in your ability to make an accurate throw becomes paralyzing. The “throwing yips” messes with your mind causing a tremendous amount of anxiety, fear, tension and apprehension. Most baseball players experiencing the yips know that it is primarily a mental issue but often fail to work to strengthen their mental game. Instead of dealing with the mental block, these players plagued with the yips hope that somehow magically the yips go away… but there is no magic solution! Pedro Alvarez, third baseman for the Pittsburgh Pirates, is having a difficult time with the throwing yips. In his five years in the Major Leagues, Alvarez has committed 110 errors at third base, most of which were throwing errors. Alvarez averages an error every five games over his career. Alvarez was tied for fifth in errors committed (23) during the 2015 season; all of those errors were from errant throws. The one thing that has prevented Alvarez from moving forward is his steadfast denial of the mental hurdle that few baseball players admit… the yips. Pittsburgh Pirates manager Clint Hurdle wants Alvarez to stop worrying about what others think about his fielding and just trust his ability to make the throw. Making an effective throw requires an automatic or unconscious action to a target. When you try to exert mental control, think about throwing or attempt not to commit an error, your ability to perform a smooth accurate throw becomes impaired. Thinking, or over thinking in this case, interferes with doing. You don’t need to think about something you have automated. Catch & Throw – Think of how fielding requires quick reaction as the ball is driven off the bat. You don’t think of fielding it. The instant the ball is hit your body unconsciously moves in the direction to field the ball. You trust your ability to make the play. The same is true for the throw. If you give yourself less time to think about throwing the ball, you are more likely to execute an accurate throw. As soon as the ball hits your glove say the key word “throw” to focus on JUST throwing. Be careful not to rush the throw but don’t give yourself time to overthink. When you rely on instincts and not thinking, your body will do what you trained it to do… perform effectively, efficiently and optimally. 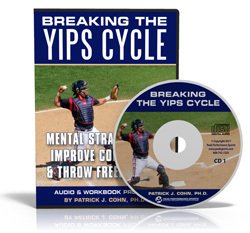 FREE Baseball Throwing Yips Report – Download Now! 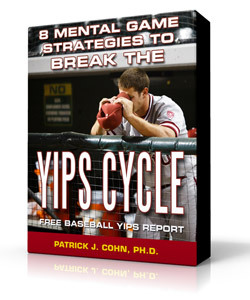 Beat The Throwing Yips in Baseball With Expert Mental Game Coaching!